Targeted behavior change can contribute to substantially lowering greenhouse gases (Erickson et al. 2012). Many studies have found that there are wide gaps in consumer knowledge, behavioral data, and educational resources relating to sustainability issues (Gustavsson et al., 2011; Parfitt et al., 2010; Smil, 2004). NWEI developed EcoChallenge to address these gaps - an online, multi-sector social platform for sharing, learning, and taking measurable action on sustainability solutions to create widespread, transformative change. Since 2015, over 40,000 have participated in the program with participation growing rapidly each year. 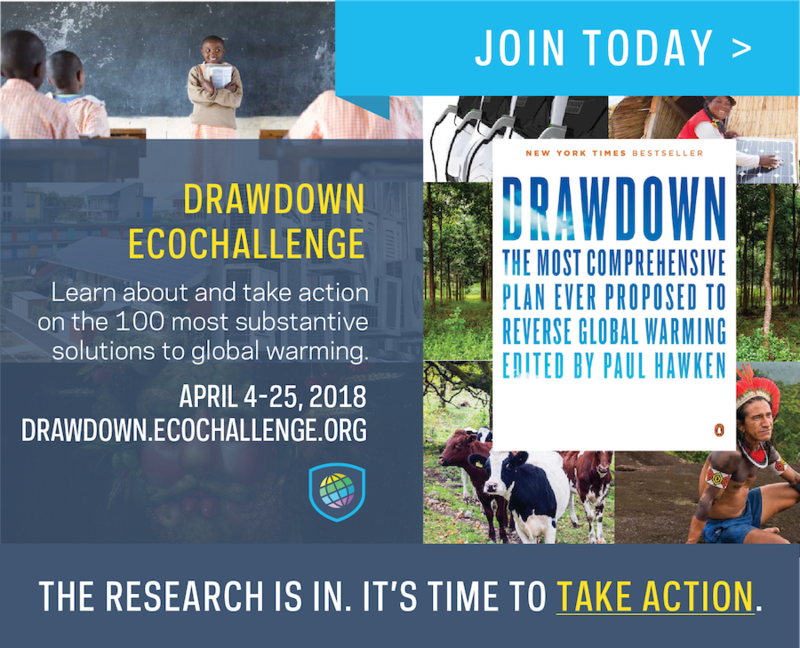 To further its work, NWEI has partnered in 2018 with Project Drawdown, the nonprofit behind New York Times best-selling book, Drawdown, to focus on the top innovative solutions to global warming. Until as recently as 2014, climate policy analysts have focused on impacts of sector-based greenhouse gas (GHG) emissions, which create a significantly lower net impact than individual consumers and consumption-based (GHG) emissions (C40.org, 2018). Individuals’ choices and behaviors are responsible for 70% of consumption-based GHG emissions (C40.org, 2018). Targeted behavior change can contribute substantially lowering greenhouse gases (Erickson et al. 2012). Even as research increasingly focuses on behavior change to mitigate climate change, little attention is devoted to mechanisms to drive behavior change (Allaway et al. 2012; Timmer et al. 2009). Furthermore, standard energy-saving strategies designed to lower individuals’ transportation and energy usage address less than half of emissions from consumer activities (Erickson et al. 2012; Allaway et al. 2018), leaving large gaps in consumer education and action surrounding food waste, goods, and other overlooked systems. EcoChallenge is an online, multi-sector social platform for sharing, learning, and taking measurable action on sustainability solutions to create widespread, transformative change. The free challenges use behavioral psychology and gamification to create long-term changes in habits. Actions are organized by categories and difficulty levels with options for customizing individual goals. A pre-assessment tool documents existing behaviors for data analysis. Curated resources help participants be successful in the actions they choose. Actions frequently overlooked in climate change mitigations are also emphasized, such as empowerment of women and girls and addressing indigenous land rights. 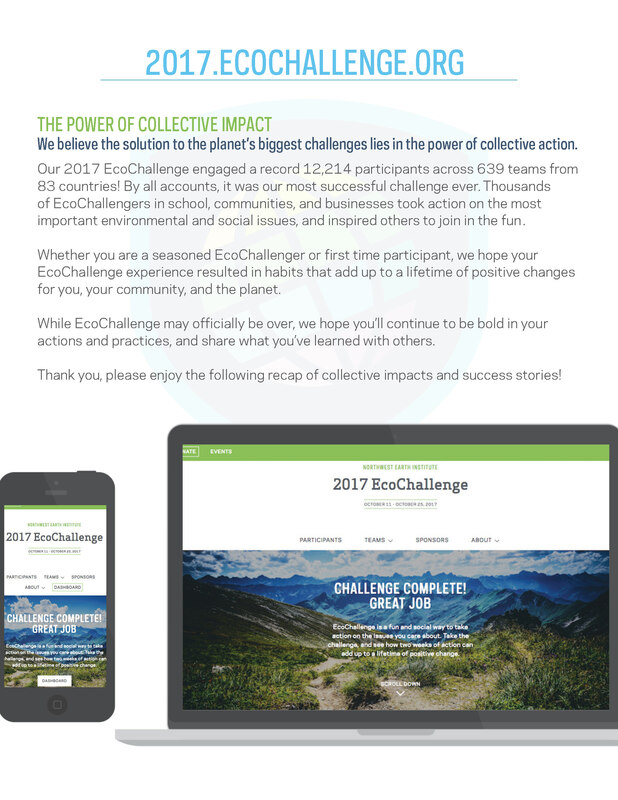 Individuals interact with their communities on EcoChallenge, reporting and discussing their goals, earning points, and receiving real-time impact on the actions they take. EcoChallenge directly addresses consumption at individual and organizational levels, as well as influences larger systemic decisions. Many studies have found that there are wide gaps in consumer knowledge, behavioral data, and educational resources relating to sustainability issues (Gustavsson et al., 2011; Parfitt et al., 2010; Smil, 2004). NWEI developed EcoChallenge to address these gaps. Serving organizations ranging from educational institutions and community organizations to global corporations, NWEI provides self-paced sustainability education designed to create learning and action on proven solutions. Within the EcoChallenge platform, communities are able to visualize the impact of collective individual change, giving more meaning to the choices that they make. By seeing other people’s stories and accomplishments, participant’s belief in their ability to change their own behaviors is reinforced. Social media tools have been shown to enhance motivation, experience, and mastery through peer learning, where students share experiences and knowledge beyond curricula to enhance learning outcomes (Hosny & Fatima 2012, Chen et al., 2011, Tower et al., 2014). EcoChallenge creates a healthy environment for trying and sustaining behaviors with social incentives and celebrations for both effort and impact. EcoChallenge’s change model connects transformative learning with behavior change, leading participants from awareness to engagement to action. Through its partnership with Project Drawdown, NWEI is using this powerful intervention to widespread engagement and action on the top climate change solutions. EcoChallenge also collects valuable data that uncovers behavioral insights and knowledge gaps of various demographics to provide more targeted and effective education and resources. NWEI shares these valuable data insights to Project Drawdown and other community partners to inform engagement strategies and sustainability policy at organizational, local, and regional levels. This service fills a key gap in program engagement and evaluation that many institutions face and invites organizations to participate in a collective impact and learning approach. Increased funding would allow NWEI to update the EcoChallenge platform to gather more meaningful data for more tailored engagement and analysis in communities. NWEI seeks to drive global behavior change through creating and tracking sustainable actions; addressing gaps in local and global sustainability engagement efforts; and supporting the lowering of global GHG consumption (Erickson et al. 2012). Since 1993, NWEI has focused on the “say-do” gap; or, the difference between an individual’s knowledge and values, and the actions they take. A study from Yale University states 88% of Americans say recycling is important, while 51% actually do it; 76% of Americans say it is important to buy locally produced food, yet only 26% actually do. EcoChallenge addresses gaps in sustainability knowledge and creates accessible and impactful action. Social marketing tools like EcoChallenge have been proven more effective in closing the say-do gap than in traditional education methods alone (McKenzie-Mohr & Smith, 2000). EcoChallenge interrupts a common “take the pledge” approach from organizations with a powerful platform that elevates solutions, facilitates action, and visualizes impact. To evaluate behavior change success, NWEI conducts two EcoChallenge post-surveys, at one week and at six months. In the most recently completed six-month evaluation, 97% of respondents said that they continue to do their EcoChallenge actions and 69% of respondents said that they have started new, additional actions. As a smaller nonprofit leveraging the power of technology, a key obstacle to EcoChallenge growth is funding. NWEI has overcome this obstacle by generating EcoChallenge earned revenue from custom clients and event sponsors to subsidize free public programs. The prize from Solution Search will be used for EcoChallenge platform additions in 2018 that will create expanded action, deeper learning, and more valuable data. New features include advancing peer learning, adding new impact measurements, upgrading the social feed, and launching a new team captain feature for more powerful collective action that connects to local issues. NWEI has set a goal of engaging 100,000 people annually by 2020. NWEI has taken a big step toward this goal by partnering with Project Drawdown. In an April 2018 pilot program, 7,247 participants from 65 countries took 75,979 actions. See drawdown.ecochallenge.org for details. The program provided a critical expansion to Project Drawdown’s work by activating their network and exposing the solutions to new audiences through widespread social sharing by participants. Along with Drawdown, there are 8 other full-scale partnerships scheduled in 2018, including Sustainable Pittsburgh, Generation 180, and a North American coalition of 30+ zoos and aquariums focused on eliminating plastic. EcoChallenge is also integrated with NWEI’s most popular textbook, Choices for Sustainable Living. EcoChallenge extends learning by better connecting course participants to additional resources; allowing new opportunities for peer reflection and feedback; and increasing action by providing more ideas, accountability, and peer support. 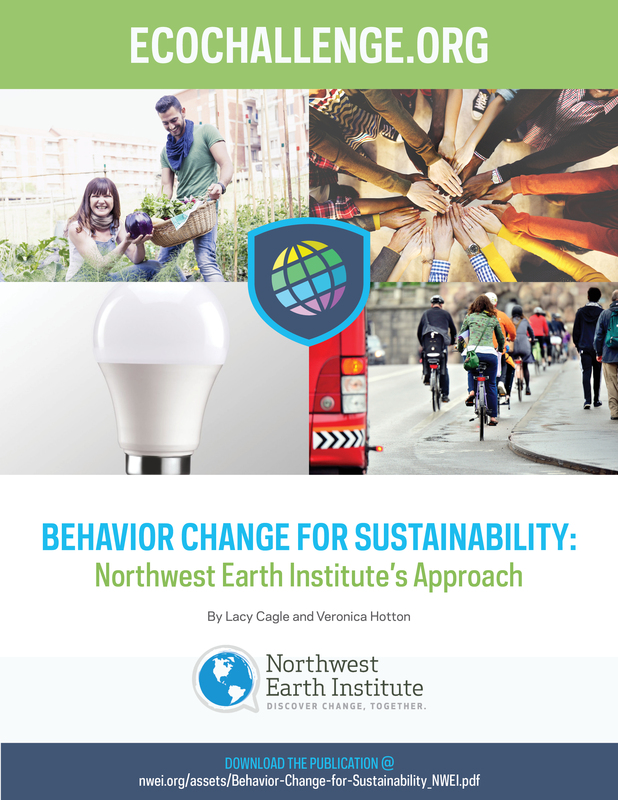 NWEI partnered with Portland State University to convert EcoChallenge data into narratives and visuals that reveal behavioral insights, needs for future programming, and lines of sustainability behavior research to create greater impact on GHG levels. The research results are being used to inform the City of Portland’s Climate Action plan. This analysis model can easily be transposed to any other city, school, or organization to drive similar policy success. NWEI has greatest impact on the leaders of tomorrow, including students and young professionals with a passion for changemaking. The past two public EcoChallenges were won by a community college and an urban high school. Participants’ self-reported behavior during the challenges reflects knowledge gained and actions taken. Participants choose levels of change that they are willing to adopt, with encouragement and resources available to take the next step toward more sustainable behavior. In this way, EcoChallenge prevents participants from reverting to previous behaviors once they have completed the challenge; behavior change is sustainable and lasts. EcoChallenge has become a key way to inspire meaningful and measurable action on Drawdown solutions. With many other partners renewing their programming each year, EcoChallenge is now a proven solution for schools and organizations seeking to engage and activate their students, employees, and community members on sustainability solutions. EcoChallenge takes a broad approach to behavior change that supports many environmental and socially desired outcomes. Examples include: •	In supporting a plant rich diet, EcoChallenge participants have also eaten over 12,000 more servings of fruits and vegetables. •	Tens of thousands of conversations were intentionally created between community members and public officials. •	During the Drawdown EcoChallenge, 786 microloans and donations were made to women in developing countries and 2,194 purchases were made from women-owned businesses. All of these impacts are measured during the duration of the challenges. Since most actions are sustained with high fidelity, the impacts raise exponentially over the life of a participant. With overall public participation increasing dramatically, the co-benefits will continue to rise exponentially. An ecosystem of market-based revenue has been created through EcoChallenge that serves as a growing source of fiscal sustainability for the program while decreasing the need for future foundational support. EcoChallenge generates revenue in four different streams: Event Sponsorships: Mission-aligned organizations seeking exposure with EcoChallenge participants. Premium Features: Additional features embedded within public EcoChallenges marketed to larger organizations and partners. Individual Donations: Contributions incentivized by points from participants with the means to support the public program. Custom EcoChallenges: Large contracts with corporations and public entities to address specific sustainability goals and initiatives. Since 2016, NWEI has invested approximately $115,000 in platform redevelopment with an additional $60,000 in direct personnel costs. This investment has resulted in: •A tenfold increase in participation, from 4,000 to 40,000. •An eightfold increase in custom EcoChallenge revenue, from $12,000 to $92,000. •Doubled event sponsorship revenue, from $28,000 to $56,000. With increased engagement possible through current partnerships, NWEI is limited only by funding and platform capabilities. Investments in EcoChallenge in 2018 will create a large return by 2020, generating hundreds of thousands of dollars in revenue, supporting a sustainable business model for the future, and proportionally increasing individual and community climate impact. With the technology and content already created, EcoChallenge can easily be scaled with decreasing costs. Free, online programs reduce participation barriers and actions can be translated easily through web browser tools. As noted above, it has already been replicated and customized in many ways. Several Drawdown partners are interested in a regional EcoChallenges including the recently launched Drawdown Europe. This will allow global solutions to be adapted to local realities. The rich data produced will result in regional comparisons that will further sector knowledge of behaviors and engagement needs. Future programming is informed by 25 years of experience, including 16 published books and 32 public and custom EcoChallenges. To eliminate need for outside funding, NWEI aims to increase revenue 30-40% through EcoChallenge while maintaining operational costs. This expands organizational capacity to create more targeted content to continue exponential growth and impact through 2020.